LTHForum.com - Grub en route to Minnesota? LTH Home > Chat > Beyond Chicagoland > Grub en route to Minnesota? Im driving up to Detroit Lakes, Minnesota to do some camping and Im taking 90 thru Madison into Minnesota. Does anyone know of any spots worth dipping off to? The only catch is I went to college in Madison and ive been back since, so Ive chowed everything there is to eat there. Hey, I just drove to Madison, and I plan on driving to Minnesota in a few weeks. I plan on doing a more detailed wrap-up, but on the way into Madison, we stopped at the Buckhorn Supper Club in Milton, WI. Very classic supper club, on a lake and all, the food, however, was only OK. Worth a stop but not a detour. I know you you know Madison, but I love to taut Mickey's. I'm curious what else comes in this thread. Right now my plan is to head through Iowa for Wilton Candy Shop, then due north to Minneapolis, and on the return trip hit Den Norske and some other places SethZ told me about (which he'll have to remind me and everyone else). While I can't vouch for the food, Norton's is owned and operated by former Husker Du member Greg Norton. I plan on visiting soon myself. Hey thanks for the reply, I am indeed back and while I did not fond anything worth noting in Minnesota, I do have some finds from Wisconsin. We actually decided that we didnt really like Minn. or at least the part of it we were in. Because of this we decided to drive back into Wisconsin and took the backroads and made our way into Illinois. I would highly suggest a trip through the backroads of Wisonsin. One thing that caught my eye was the fact that every little town in Wisconsin had the same thing, a little downtown strip with a few saloons, an old independant movie theatre, a shoe store, pharmacy and independent book store. Im from Lincoln Park so this was interesting to me, all these towns hadnt changed in 100 years and while they were all similar they were each diifferent in their own right. On the way up we stopped at a smokehouse in Eau Claire named "Mikes Smokehouse". Upon entering the place I got the feeling that it was going to be good stuff, they had many articles and plaques on the wall praising the BBQ and stacks of wood along the side of the restaurant. We ended up getting the special that night which was smoked prime rib and also a BBQ platter which featured ribs, pulled pork, fish, ham and a pork chop. Now the bad news. The food was bad, it had no smoke flavor whatsoever and tasted as though it was somebodys first attempt at BBQ, I wouldnt rec this place to anyone, the prime rib was way too fatty as well. During the ride back we chose the backroads and cruised and or stopped through places like Black River Falls (great tastee freeze), Black Earth (great local butcher), Mt. Horeb (home of the national mustard museum), Wisconsin Rapids (great pub food), New Glarus (Americas Little Switzerland and home of New Glarus brewing comp. ), Baraboo (Great Burgers at Monks) Sauk City (birthplace of Culvers) amongst many other towns I cant remember right now. In fact this wasnt the first time ive been through these parts. When I went to school in Madison there would be days when I didnt want to do work and I would just jump in my car and ride the rolling hills of Wisc. or go grab lunch in New Glarus so if anyone ever needs any rec's for these parts I have done alot of the areas offerings. As far as Madison if you ever find yourself in that area there a few must do's in my mind. First is Pel Meni, a russian dumpling spot on State St. They offer meat and potatos variety and they are done the traditional way or their take on it which includes, vinegar, hot sauce, curry powder and cilantro with butter. I go for the house special large order ($7) and that includes a drink. Another one of my favorite shacks is Guantanamera, a small restaurant and food cart, they serve Cuban-style food at affordable prices to workers and students. Try their ropa viejo and chicken. This place is run by a cuban couple and theyve been selling cuban food around the world for over 20 years. These are just 2 of many wonderful spots Madison offers. Detroit Lakes is to visitors of Minnesota what Gary, Indiana is to visitors of the Chicago area. Plus the main route to get there I-94 is about the least pleasant drive you could find in MN. Sorry you had to experience that -- next time (if there is one) stay closer to the major rivers and Lake Superior, plus the back roads and you'll enjoy more of what MN has to offer. But the primary reason I post is that Schumacher's in New Prague, mentioned above, closed in May of last year. When you're about 100 miles away from MSP, there is a Roadfood shrine at the Norsk Nook in Osseo, WI. If you do nothing else, you order some pie. Just out of curiousity, we're you up in Detroit Lakes for the 10K Lakes Music Festival? Wanted to go this year, will plan on it next year, and these tips will help trip up. Norske Nook also sells whole pies to go, if you happen to go by there at a non-pie time of day--that is, if there is such a thing. Ok, I can see, maybe, someone starting their trip to Minnesota with sandwiches at H.P. Schmaltz's in Naperville (still good even as the buzz has died) but then Mendota, Illinois, the Quad cities, Amana Colonies...I think that's not quite grub on the way to Minnesota so, I leave those places to another post, another time. I think the generally held view is the way to Minnesota is Northwest through Wisconsin. So, that's what I've posted below. Like most road fooders, we have 3 ways of finding grub along the way. First, there's the years of reading and research (as exemplified by the Norske Nook below); there's the opposite, which is the just try or kiss a few frogs school and there's the third approach, studying as you go-go. The last approach can rely on visual clues, like a sign for home made pies or it can rely on careful review of media on hand--we all know the wonders ReneG can do with the yellow pages. To help our eating, we keep a few resources in the car (or Dad picks them up as he goes along), and through various secret VI family algorithms, we can often use these to find decent places. When the drive from Mall of America to Osseo, Wisconsin took too long, we found High Shores on the path to Chippewa Falls. It's pretty much what you expect, nay love, in a Wisconsin supper club: on a lake; no relish tray, but there's a salad bar with pickled herring, fresh made salads and cheese spread; the menu features blue gills and perch (which tasted nearly the same). The best thing there were the cheesy potato options that come with dinner. 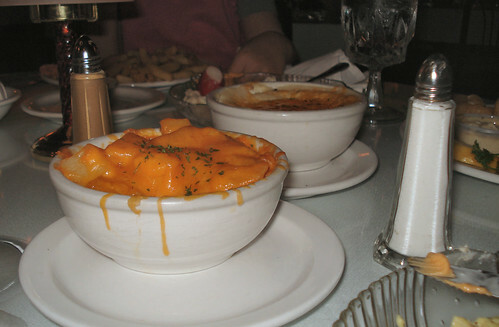 Below is au gratin and the house speciality, which is a combination of cheddar cheese and mashed potatoes. Is the cooking here stellar? Well, the mashed potatoes were alternatively thin and chunky depending on where the spoon landed; the fish a bit heavy on the batter. Still, I would gladly return here if in the area. 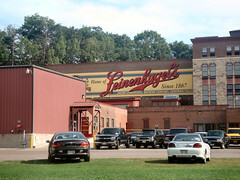 There's plenty to do in and around Chippewa Falls. After the tour, you can drink the beers*. Slightly past what amounts to Main Street in Chippewa Falls is this great small town market. So retro, I mean old fashioned, they sold candy cigarettes; also house made potato dumplings, local canned goods including pickled green beans, farm fresh sweet corn and tomatoes, and an assortment of their own (or produced nearby) meats and sausages. Across the street, about, from Sokups, is Olson's. After a week of eating some pretty good ice cream in the Quad Cities, Minneapolis and St. Paul, this was the best. I'm not sure why Sophia's not looking happier about eating ice cream before lunch. 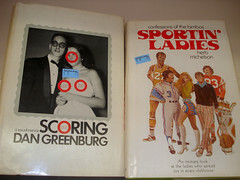 We always have to visit the local thrift store/used book store. I was a bit surprised to find out what they're reading in middle America. Lunch a bit north of Chippewa Falls was about the best meal we had the whole trip (and we mostly ate well). It's like if Paul Virant ran a supper club. Yup, it's on a lake; the bar looks the same, but the fried blue grills are really good, the tomatoes in the BLT are heirloom and the fries, well just look. Native Bay was the great find, sussed out from an ad in a book in our motel! Norske Nook was the great, really great, disappointment of the entire trip. I have a hard time believing this place was ever that good, even as defenders point out to its recent change in ownership. I'm being generous to them with the picture below. We drove about an hour south from Chippewa Falls for the fabled pies here. 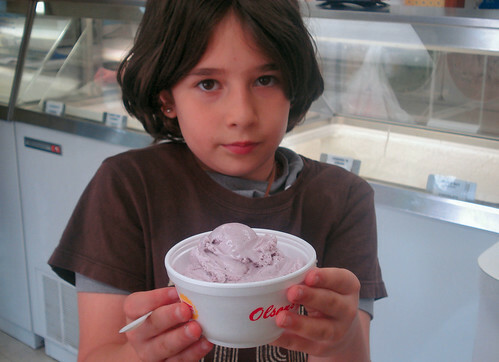 We ordered four: sour cream raspberry, blackberry crunch, chocolate cream and lemon meringue. Most of them, well, sucked. That cream, well, it's not cream, rather it's creme, or whipped topping or Cool, freakin' Whip. That's not what I want in the dairy state. And when asked, they could not even tell me where the fruits came from for those pies. The crusts were tired, dry and just industrial tasting. Actually, the one pie featured above, the blackberry crust was a lot better than the others, a fresher crust and real fruit, like it was made by another source. Still, we had enough variety to see this was the outlier. Not worth it at all. 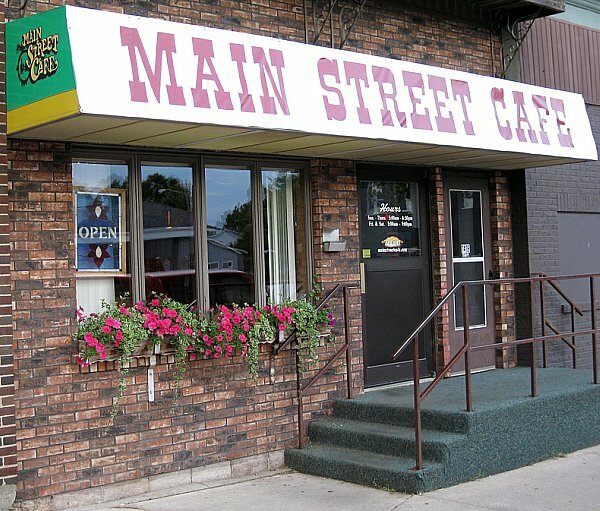 We all have restaurants we remember from waaaaaaaaay back, and this is one of the ones that stands out the most. I can still picture the pitchers of milk that came with meals, and there was something about the pewter pitchers that made it taste so good. That's gone, health department, but the rest, well it stacked up pretty darn good to nostalgia. It aint gourmet and it aint even quality supper club fare, but the stuff was all made with some care, some effort. The fried chicken was pretty darn good, really! I'd go again fer sure. Sadly, my camera ran out of battery power here (I was looking at the wrong tiny light). Madison's been discussed in other threads. Los Chicanos is not too far from the Interstate exit for Beloit, and after a week of mostly kountry kookin' we were ready for something, well a bit more urban. 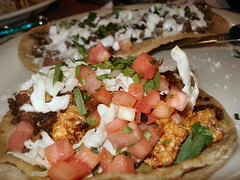 Los Chicanos is not Quebrada good, but in Chicago, it'd be considered a good neighborhood taqueria. 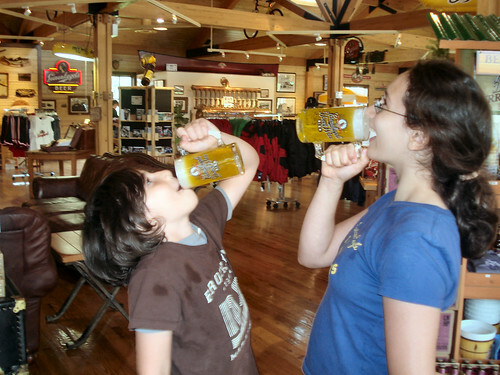 *Yes, you can sample the beers, pre or post tour, but not minors. Last edited by Vital Information on August 31st, 2006, 7:50 pm, edited 1 time in total. VI, it's been many years since I've driven this route but I just wanted to say, Great post! and beautiful pictures! We will be making the drive from Chicago to Duluth in October so this thread is a real find. If anyone has any updates we'd sure like to hear them. I think the route through Eau Claire and Chippewa Falls is the way to go. We have to travel mainly on the interstate on the way up because we will be hauling a sailboat that needs 13 feet clearance. Maybe hit New Glarus and Monroe on the way back. FYI - I clicked on Native Bay and they sadly closed at the end of June. If you will be hauling a boat, Hwy 53 N from Eau Claire to Duluth would be the route to take. I visit that area several times per year, and most of the restaurants I've tried are pretty ordinary. You might consider Foxxy's. It's our go to restaurant for special occasions. They serve supper club type fare including steaks and seafood, along with pastas and scenic views from the dining room windows. They start serving at 4 pm, and if you arrive early, the parking lot could accommodate a boat trailer. https://www.facebook.com/FoxxysBarandGrill for menu and directions. 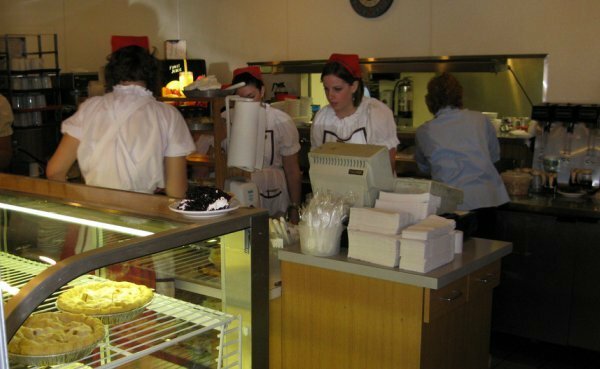 For pie, I usually stop at the Trego Dinner Bell because they will make a sugar free pie upon request (call a day ahead). 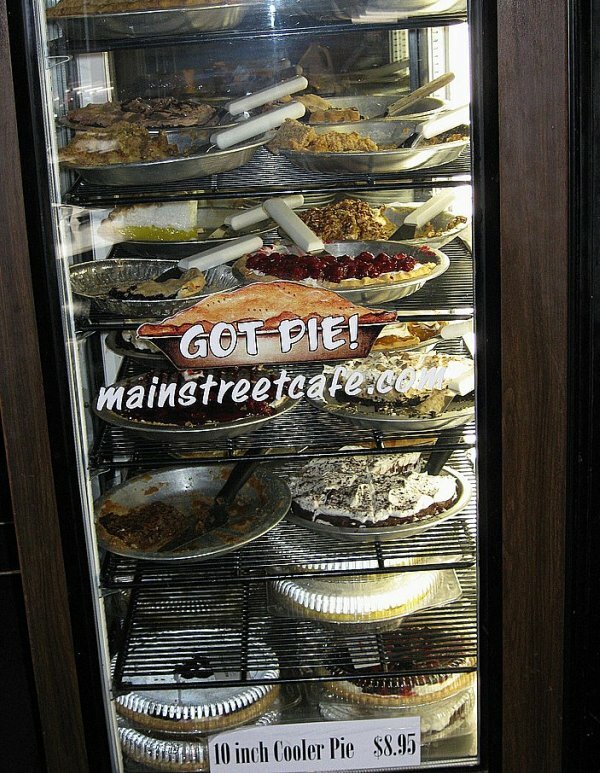 It is a diner type restaurant with pie and apple dumplings on display in the glass case at the front door (see photo in link below). I've only tried the sugar free pie (usually apple but sometimes cherry), but the other offerings in the glass case look good. They have a huge parking lot that would accommodate a boat trailer. edited to note that as of 3/27/2015, Foxxy's website is no longer working and substitute a link to their facebook page (which was last updated in 2013) - you may want to call before visiting to make sure Foxxy's is still open. Last edited by mrsm on March 27th, 2015, 8:23 pm, edited 1 time in total. In Osseo, where Norske Nook is, we were just minutes away from Castle Rock Organic Dairy Farm which trusted sources say makes some outstanding ice cream. Unfortunately, we took a wrong turn and needed to get going, so we missed out on trying it. 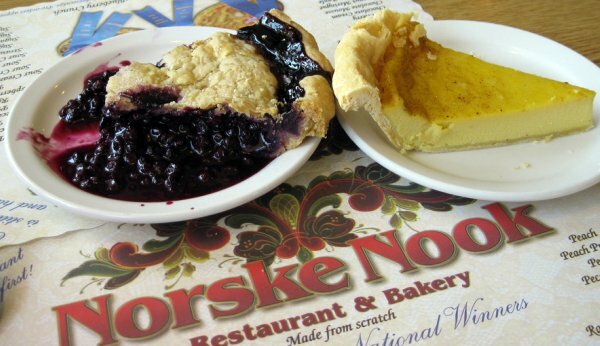 Part of what made the Norske Nook experience so disappointing is that expectations were high for pie in these parts, as a result of an absolutely stellar experience we had a couple of days earlier. 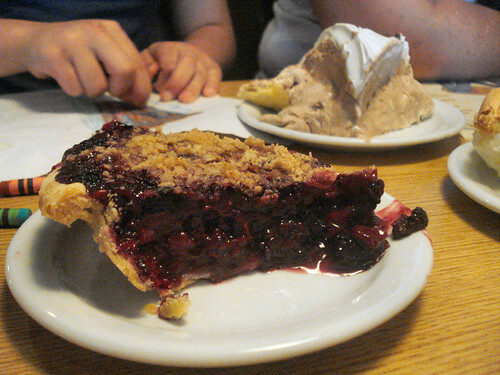 At Main Street Cafe in Bloomer, WI we bought the best blueberry pie I've ever had. It was made from the town's own local berries, and the short crust was flaky and had superb flavor. I wish I had snapped a picture of the pie, but I'm afraid the display case will have to suffice. I must agree with the last post regarding the Nook. 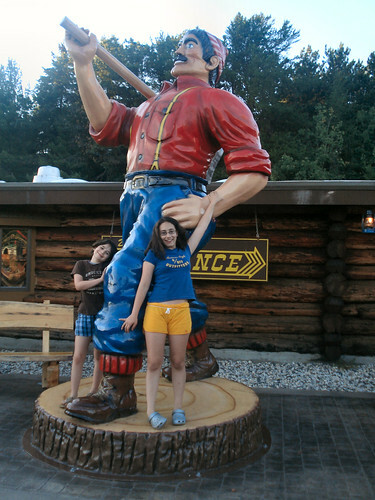 I was VERY disappointed the last time we stopped at the Norske Nook. I have crossed it off of my list of places to stop when driving Up North. Ms. Ingie wrote: I must agree with the last post regarding the Nook. I was VERY disappointed the last time we stopped at the Norske Nook. I have crossed it off of my list of places to stop when driving Up North. It is written in a very folksy manner, and includes her pie recipes and baking tips. I've never tried making one of her pie recipes , but everything else I've made from this cookbook has been enjoyable. It even includes recipes for things like head cheese and making your own soap. Sad to learn about the decline of the Nook. 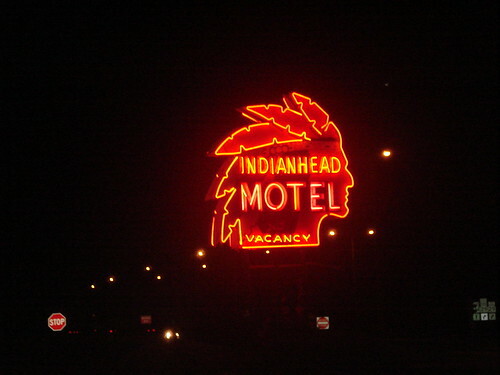 Whenever I headed south from the Twin Cities (1976-90) that was my first stop. Well, it is indelible in my memory. Last weekend's trip to Grandma's in Arkansaw, WI was pretty enjoyable food-wise. I followed up on Kennyz's mention of Castle Rock Dairy in Osseo. The path from 94 to the dairy is about as picturesque as it gets, with cows lazily lolling about grassy hills. The front room of the dairy contains 2 glass-front refrigerators with milk and cheese, a freezer with all the ice cream, and a large picture window that lets you see some of the workers moving between stainless steel vats. I went with a half-gallon of molasses chocolate chip ice cream, a half gallon of whole milk, and 3 varieties of the raw cheddar cheese: regular, medium, and sharp. The helpful attendant informed me that they make their ice cream with 17% fat instead of the standard 13 or 14, so it should taste denser and be more filling than regular ice cream. All I noticed was just how "clean" the ice cream and milk tasted, with no off odors or aftertastes. I wish I had also picked up some of the peach and blueberry ice cream. They also sell frozen cuts of grass-fed beef. Down Hwy 10 in Mondovi is Gunderson's, a meat shop. Pork brains, $2.34/lb short ribs, "dried beef", and homemade bratwurst sausage. Awesome place and courteous service. Next time I hope to try every one of their sausages. Saturday was the farmer's market in Eau Claire. A huge variety of vendors under a permanent U-shaped pavilion along the Chippewa River. If you're close to Eau Claire on a Saturday, do not miss this. There was a band performing 80's rock, an ice cream stand, bakers, cheesemakers, meat producers selling chevron and buffalo, and all the Hmong farmers with their colorful bounty of produce. The whole event was surrounded by a very festival-like atmosphere. Then just down the road was Just Local, a "community supported, worker owned cooperative". Plenty of fruits and veggies with a list of where each item originated, more local meats, meat, honey, maple syrup and cheese, cheese, cheese. Frankly, there wasn't any more room in my body or car for anything other than a six-pack of New Glarus beer (though I'm just beginning to figure out that I should have looked for Walter's beer). So for me, a great trip. Who would have thought that the trip to Grandma's house, a 6.5 hour misery slog in my youth, would today yield so much exciting local fruit? About 5 miles north of Spooner on Wisconsin highway 53 lies the small town of Trego. We visited the Riverbend Bar and Family Restaurant early on a Wednesday night, based in part on our surmise that if the parking lot was full at 4:30 pm, there must be something good on offer. The Riverbend is located near the junction of Hwy 53 and 63 in Trego (on Hwy 63 less than ¼ mile east of Hwy 53). The entrance leads directly into a very smoky bar. Fortunately, there is a separate non-smoking dining room. The knotty pine paneled room has several windows with views overlooking a wooded area that gently slopes down towards the Namekagon River. We noticed a white board in the bar announcing that the Wednesday special was the “buck a burger” which I assumed was some sort of appetizer burger served at the bar. The restaurant was already extremely busy when we arrived, and it remained so during the hour or so that we were there, with a steady turnover of tables. 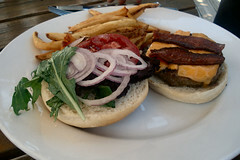 All of the other diners ordered the $1 burger special, which we observed was a full restaurant size/style burger. Toppings such as cheese and mushrooms are 25 or 50 cents extra. Fries are $1 also. Perhaps that explains why the somewhat harried young waitress seemed genuinely perplexed when we asked to see menus, and even more surprised when we ordered entrees from the dinner menu. Baked pork ribs: very large and meaty and slightly chewy in a good way (not at all meat-jello). The ribs were topped with a mild sauce that allowed the flavor and seasonings of the meat to dominate. baked walleye (deep fried is also available): was a generous portion of perfectly cooked, delicately flavored, flaky walleye, seasoned with a dried herb mix, and served with lemon and butter. prime rib and jumbo shrimp combo: The prime rib was the only disappointment of the meal. It was served medium well even though it was ordered medium rare, and it appeared to have been reheated. We suspect that the kitchen tried to compensate by serving a huge slice (8 oz. was ordered, yet the portion served was easily 12 oz.). The prime rib was accompanied by 3 sauted jumbo shrimp, which happily lived up to their billing in terms of size. The shrimp were served with drawn butter. 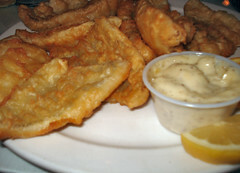 Scallops and deep-fried shrimp are also offered. All entrees are served with soup or salad and choice of potato. We all chose the tomato basil soup of the day. It was an enjoyable choice, slightly creamy with chunks of tomato and flecks of basil. Potato choices include baked, fries, waffle fries, hash browns and Lyonnaise. The Lyonnaise were crispy brown hash browns that tasted as though they had been fried in butter, and topped with grilled onions. Waffle fries were perfectly crispy and well seasoned. Our dinner entrees including cocktails and tip ran about $20 - $25 per person, but cost could be considerably less if you order from the specials or sandwich menu. For those interested in prime rib, a better choice (if you are willing to forego ambience) is the nearby Prime Bar, located less than a mile south on Hwy 53. I make the trip from Chicago to Southeastern Minnesota several times a year, but outside of Culver's pit-stops I haven't discovered any great roadside diners. I do highly recommend Harbor View restaurant in Pepin, Wisconsin. A changing daily menu with locally sourced meat and produce, and just a really nice atmosphere. 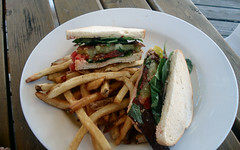 It has a slightly upscale menu, but is completely casual in atmosphere. Many people boat over from the Minnesota side and wait at the docks for an available table (no reservations.) The restaurant is seasonal, closed Thanksgiving through winter. Also on the Wisconsin side of the Mississippi, I encourage beer enthusiasts to stop at the Monarch Tavern in Fountain City. Their Irish Spring Bock is really good, and there are 3 other Fountain City brews that are only available here. It is in a picturesque River Town and a wonderful old 19th century building. 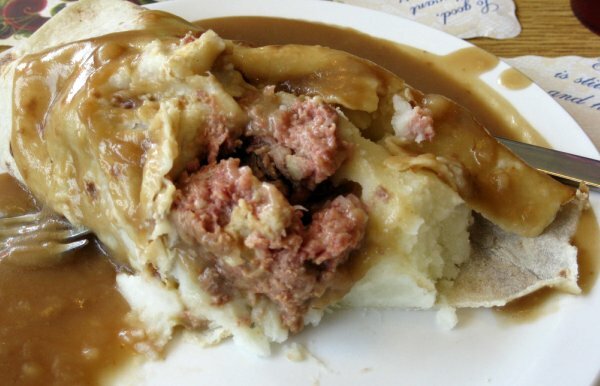 There is also a huge menu, of which "Irish" and pizza dominate if you're hungry. The harbor view looks good! I stop by the Koffee Kup when I can when I am going that way. Good breakfast. I love their shrimp bisque for some reason! Good diner food. About 10 minutes off the interstate though. So a little a bit out of the way. This Thursday, Cabbagehead and I are taking No. 1 Son to St. Paul to check out Macalester College. We'll be taking 94 the whole way -- get on at Touhy Avenue, get off 1/2 mile from the college in St. Paul. I'm looking for advice about where to stop along the way for lunch. We need to leave pretty early in the morning, so we'll be looking for lunch beyond Madison, say from the Dells on. I've looked at the Dells threads but haven't seen too much, and some places may have already closed for the season. I've combed the Twin Cities threads, but any spots you might want to add would be appreciated, especially places near Macalester. We'll be eating 2 dinners, one with kid and one without. We'll also have a bit more of a leisurely drive home on Saturday, so other I-94 recommendations would be very helpful too. Thanks! EvA wrote: TI've combed the Twin Cities threads, but any spots you might want to add would be appreciated, especially places near Macalester. We'll be eating 2 dinners, one with kid and one without. Thanks! While in St. Paul, you may want to try to hit Heartland for dinner one of the nights. It's very close to the college. The chef, Tony Russo, has been a James Beard finalist and focuses on local foods. It's one of the stronger restaurants in the Twin Cities. Something that's worked for me is taking along a good loaf of bread and stopping in Mauston for terrific sausage and cheese at these two places. The assembled sandwiches can leave a lingering smell in the car, but oh what a glorious aroma it is. Thanks, tyrus and TomInSkokie, for the helpful suggestions. EvA wrote: This Thursday, Cabbagehead and I are taking No. 1 Son to St. Paul to check out Macalester College. We'll be taking 94 the whole way -- get on at Touhy Avenue, get off 1/2 mile from the college in St. Paul. Faster to go I-90 and pick up 94 at Tomah, saves about thirty miles, plus you miss the traffic around Milwaukee. (I've done the drive to the Twin Cities maybe 30 times over the years). BTW, Macalaster has one of the biggest endowments of any college in the US (no jokes here). *Sorry to get geeky with the numbers. I am the co-author of a book on the economics of higher education and know way too much about endowments in higher education. I’ve done the trip a couple times—my brother is actually goes to Macalester. So I second almost everything that’s been said, about taking 90 to 94, the Norske Nook not being what it once was, etc. We’ve stopped in a couple small towns in Wisconsin for lunch, and none of them have been real hits or misses. Jen’s Alpine Café and Soup Kitchen in Baraboo had pretty solid soup options four or five homemade ones as I recall, although I was happy just to not be eating in the Wisconsin Dells (Baraboo is right before the Dells). We always hit Madison too early and Eau Claire too late for those to be viable options on the way. Black River Falls and Hixton had no good dining options apparent to us. Hell’s Kitchen is worth a trip, as is the Hmongtown Marketplace, if you’re into the unique experience only St. Paul can offer. The market is open 7 days a week and is basically a great reflection of the Hmong community, complete with anything that you’d expect to find at a large outdoor-indoor combination market. They have quite a bit of interesting produce in addition to prepared food booths—funky variations on bubble tea, even funkier papaya salads and larbs. We ended up getting a bunch of papaya salad to go and ate it as part of a picnic on our way back to Chicago. A picnic is a pretty good idea for the trip there or back, as TominSkokie recommended. Otherwise, I’d really recommend doing some exploring along University Ave. in St. Paul. There are some really fascinating restaurant options (mostly Vietnamese and Hmong) that are usually affordable and delicious. For places closer to Macalester, the Grand Ave. drag is pretty tried and true, and of course, Macalester’s dining hall itself is pretty great as far as college dining halls go. We had a great trip to St. Paul and were able to rely on LTHer-recommended places for a number of meals. I’d like to add a few bits of info to this thread (and cross-post to the Twin Cities and Tomah threads as well). We were in a big hurry heading north so we stopped at Culver’s in Mauston, Wisconsin (off I-90/94), which was fine and fast. We also stopped at the Culver’s in Edgerton, Wisconsin (off I-90), which is the world’s largest (! ), per its own advertising, where Cabbagehead grabbed a coffee on our way home yesterday. In St. Paul, we enjoyed Ngon Vietnamese Bistro, recommended here by Santander. The restaurant is on a corner in an old building with apartments on top and a back patio that must be great in warmer weather. In a way it reminded us of Tre Kronor, although Ngon is much bigger inside, with high ceilings and crown molding. The place was, sadly, awfully empty on a Thursday evening and also awfully dark. It was actually hard to see what we were eating, and reading the menu with our middle-aged eyes required using the battery-operated “candles” on the tables as little inadequate flashlights. But the food was good! The charcuterie plate, with elk sausage and duck confit, diced pickled beets, and pickled daikon, was very good, as was the rabbit crispy dumpling in curry sauce, a large puff pastry roll filled with tasty rabbit and veggies. For mains, we each had soup. My pho with oxtail had nice pieces of oxtail and was good but not great; I found the taste just a bit flat. Cabbagehead’s Hu Tieu (pork broth soup) was excellent, and he was a happy man. A pleasant Vietnamese coffee completed our meal. Our second dinner, with our son, was at Casper’s and Runyon’s Nook, recommended by Tyrus earlier in this thread and in other Twin Cities threads, for our first Juicy Lucys. We loved this place and the burgers. The Nook is a small bar filled with sports memorabilia from the Catholic high school across the street that was packing them in on a Friday night—college kids, families of three generations, and everyone in between. Nice beer selection on tap and the burgers are really outstanding. Husband and son each had a Juicy Lucy, and I had a blue cheese and mushroom burger; Dad had the Winter Ale from local brewery Summit, dark, caramel-brown and tasty, I had a Leinie Honeyweiss with lemon, and No.1 Son had 1900 Root Beer, all on tap. The fries were outstanding, thin and crisp with a bit of skin, and the onion rings and sweet potato fries were also very good. 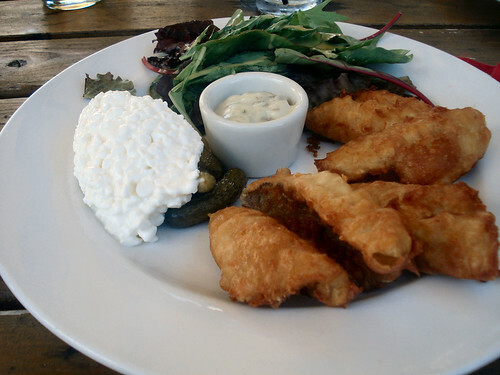 The “Leprechaun Legs” appetizer, deep-fried fresh green beans, was surprisingly good and provided something green in our dinner. Very reasonable prices, nice people, and excellent food. Great recommendation, thanks! We didn’t have time to hit the Hmong market, unfortunately, but we did stop at the downtown St. Paul Farmers' Market on our way out of town. There were plenty of Hmong-operated vegetable stalls there, showcasing absolutely pristine bok choy, parsnips, broccoli, cauliflower in several colors, Brussels sprouts, potatoes, leeks, fresh herbs, gourds, pumpkins, apples, and more. Their prices were very good too, and we bought quite a bit, including a gorgeous dried vegetable and flower swag for my Thanksgiving table. We couldn’t resist the pretty little bunches of red peppers sprinkled in with the more usual gourds and dried plants and flowers, although my son said the Hmong girl selling them was even prettier…. What a great place—right downtown with beautiful produce, various prepared foods (we tried a pretty good spring roll), honey, maple syrup, soaps, and so on, plus free parking and people of all sorts shopping on a drizzly Saturday morning. We stopped for lunch at the Target Bluff German Haus in Camp Douglas, mentioned here in the Tomah, Wisconsin, thread. We liked the place and the food quite a bit, although it might not be to everyone’s taste. The Target Bluff is an impressive towering bluff across the highway from German Haus. The restaurant is gemütlich kitsch, with heavy chandeliers and torch-like wall sconces, dark carpeting and large studs on the padded chairs. Saturday lunch is not their busy time, but we had very tasty sandwiches while serenaded by the easy-listening style German songs, including polkas and the inevitable yodeling. We enjoyed homemade corned beef on fresh marble rye, fresh bratwurst (they had a choice of smoked too) on an excellent toasted, buttered bun, and the Target Burger mit Rolf's special sauce. We also ordered two sides, sauerkraut and German potato salad, both very respectable versions. German Haus also boasts a large bar area, numbered cloakrooms, and an attached gift shoppe with a small but good selection of imported German foods, chocolates, and wines, as well as some cookies and pies baked on the premises. They also rent bicycles. We met the baker, Amy, who was working behind the counter in the shop. We bought her favorite cookies, craisin and white chocolate chunk; they are soft and not too sweet. We like them. Amy told us that Saturday night was a monthly German smorgasbord of all you can eat German specialties for $15.95 and predicted the restaurant would be very crowded later. She showed us the menu, and it looked fantastic. Check their web site for the dates. Thanks, TomInSkokie, for the Carr’s Cheese and Wisconsin River Meats recommendations in Mauston. We picked up some goodies at both. 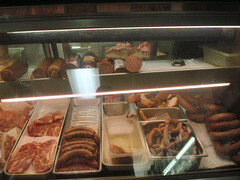 Wisconsin River Meats is about a 10-minute drive out of Mauston proper but worth it. We knew we were in Wisconsin when we saw their sign about checking in the office first before unloading deer for processing (it’s bow-hunting season). We chewed our way through some delicious beef jerky, full of flavor but not too salty, on the ride home, and the pork breakfast sausages I cooked this morning were outstanding—juicy with a fresh sage taste. We can’t wait to taste the bacon and summer sausage and the three cheeses from Carr’s: 8-year old cheddar, a sheep’s milk blue, and smoked fontina. If No. 1 Son ends up at Mac, we’ll be happy to make some trips back to the Twin Cities and do more exploring of the food on the road and there.